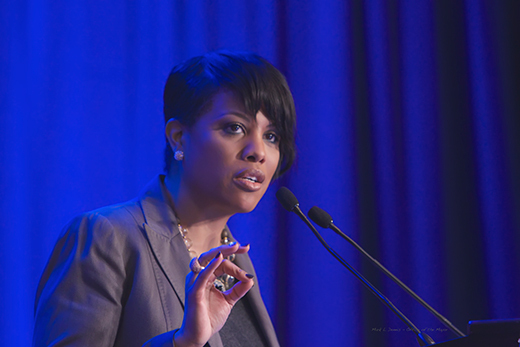 Baltimore Mayor Stephanie Rawlings-Blake will address "Baltimore: A City of Recovery, Resilience and Reform" at the annual Grace Towns Hamilton Lecture on April 7 at Emory University. Her lecture is scheduled at 4 p.m. in the Winship Ballroom of the Dobbs University Center. Rawlings-Blake has served the city for 21 years – first as the youngest person elected to the Baltimore City Council, then as council president, before becoming mayor in 2010. She recently announced that she will not seek re-election. Her talk is sponsored by the Department of African American Studies and the James Weldon Johnson Institute at Emory. Rawlings-Blake and the city were thrust into the national spotlight last year during riots over the death of Freddie Gray while in police custody. She has since worked with police and first responders in their work to restore order but also has advocated for reform, such as new body cameras that city officers will begin wearing this spring. In her most recent State of the City address, Rawlings-Blake also highlighted broader policy successes, such as pension reform. Lawrence Jackson, a Winship Distinguished Research Professor in African American Studies and English in Emory College, focused his African American Studies 100 course last fall on the city and the uprising. The students developed research portfolios in class and worked with grassroots advocacy groups in four areas – mass incarceration, educational inequality, residential segregation and healthcare disparities — in black urban settings in general and Baltimore in particular. They traveled to the city in December to present their research and solution ideas to community leaders and have set up a website to continue the dialogue. Jackson, who grew up in Baltimore and knows Rawlings-Blake from childhood, says it is happy coincidence for her visit to coincide with his class' research. "We hope she'll share with us the challenges of decision-making during a crisis," Jackson says of the riots, "as well as how you both harness strong dissent against the police and uphold the law to move an entire city forward. There are so many lessons to learn." The Grace Towns Hamilton lecture honors the native Atlantan who was the first African-American woman elected to a state legislature in the Deep South. When she was elected in 1966, Hamilton also was the first African American to be elected to the Georgia Legislature since Reconstruction. The lecture is free and open to the public. For more information call 404-727-6847.